I have the above mechanism, where I control a single-phase fan motor's switch. I mean instead of a mechanical switch, an AC/DC SSR is switching ON or OFF from a remote place by a constant DC input (DC in in figure, 10V or zero). When the SSR is ON, it will stay ON for long time like an hour or more. I mean it is not for speed controlling itself, it should act just to turn on the fan or turn off. The speed controller in the figure is an AC phase controlled speed controller(like a dimmer for inductive loads). 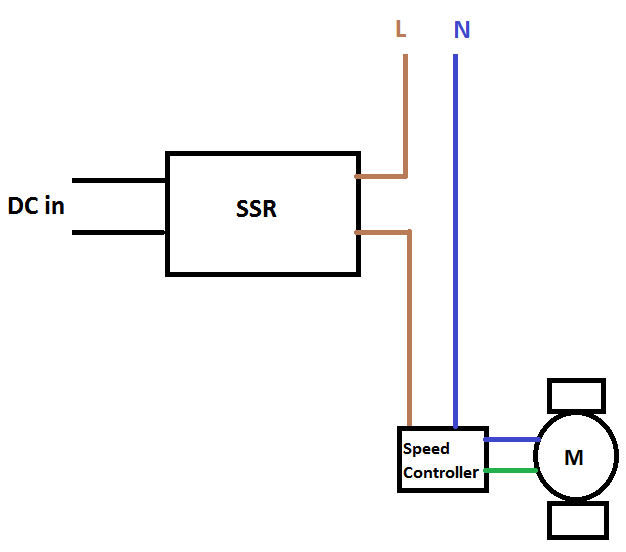 As you see in my illustration when the SSR is ON, the hot line is connected to the speed controller. The fan speed is controlled via the poti knob of the speed controller manually. The data-sheet says "Switching Type: Zero Crossing" and "Output device: SCR"
*They claim a zero-crossing SSR is not recommended for an inductive load. 1-) Do I need a random-fire SSR instead of a zero-crossing one considering my illustration and the articles I read? I'm asking becasue I thought the speed controller would be taking care of dV/dt effects even I use the zero-crossing one. 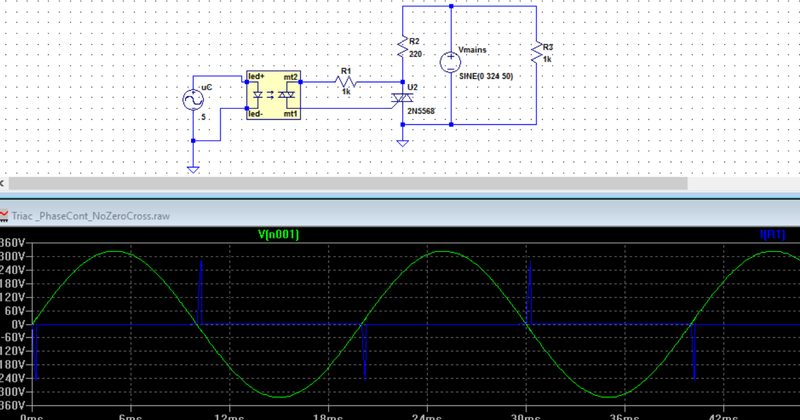 But I'm not sure its effect on the SSR's SCR or triac if I use the one I have with zero-crossing. Its data-sheet says "Switching Type: Random" and "Output device: Triac"
Which one would you recommend in my case? 2-) This is a bit confusing for me because I cannot find any wave forms of the inner trigger circuitry(the part which triggers SCR or the triac) when there is continuous DC input for lets say minutes or hours. What I understand until now when there is zero-crossing, the circuitry detects zero crossing points and fires each time when the voltage crosses zero point. So what I understand is that, in one second for a 50Hz AC, the SCR fires 100 times if the DC in is constant and ON for one second . Is that right? If above is true, my question is about the random-firing SSR. Okay in zero-crossing case the SCR detects and knows when to fire. But how about random firing case? How is the triac inside the SSR is fired? What does firing it randomly means if the DC in constant ON all the time? How often it fires in this case and would that create some surges? Or in constant DC in case the triac is always on and there is no firing? The confusion arises because a triac is not a transistor and unlike a transistor it will not be ON when its gate is always ON right? I struggled to find an answer but I failed and had to write as a question. I would be very glad if you can illustrate the wave form in this case. 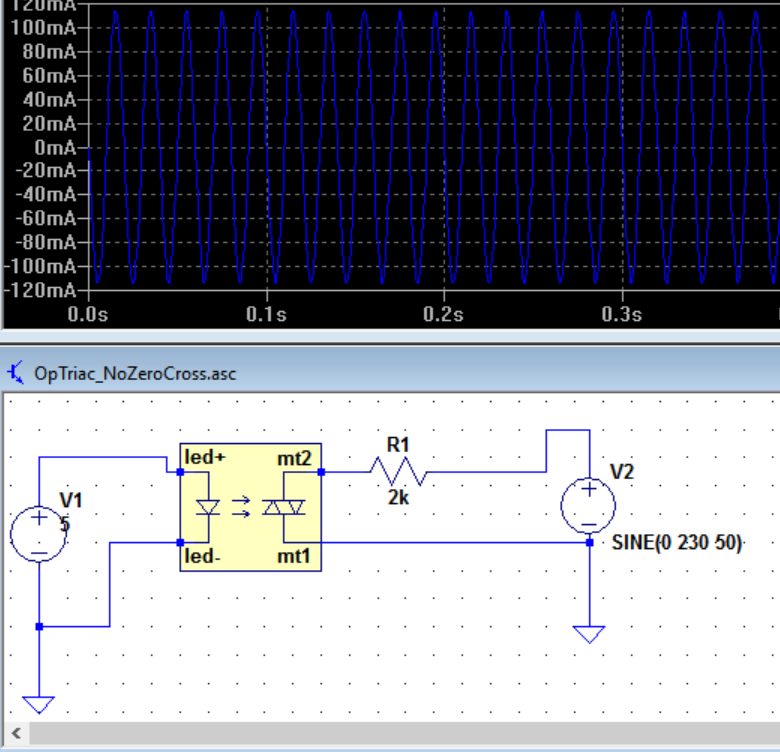 As you see below the opto-triac fires at each zero crossing point when DC in is 5V constant all the time. I'm asking is that the same case in zero-crossing SSRs? As you see above the opto-triac again fires at each zero crossing. What is going on here? It is not random. If your circuit is working OK it will probably keep working OK. Some SSRs give trouble with large inductive loads as the current lags the voltage. If your fan is less than a couple of hundred watts you should be OK. Figure 1. Random SSR and zero-cross SSR. The random SSR usually uses two triacs. The first is a small photo-triac. When the LED is turned on the photo-triac will turn on and feed current to the gate of the power triac and turn it on. R1 shunts away any leakage current to prevent false triggering. If the LED is kept lit this SSR will turn on after every zero-cross and stay on until the next one. If it is turned on mid-cycle it will turn on immediately. Figure 2. "Random" or phase-controlled dimming. The zero-cross SSR uses the same LED opto-isolation arrangement but usually turns on a transistor. 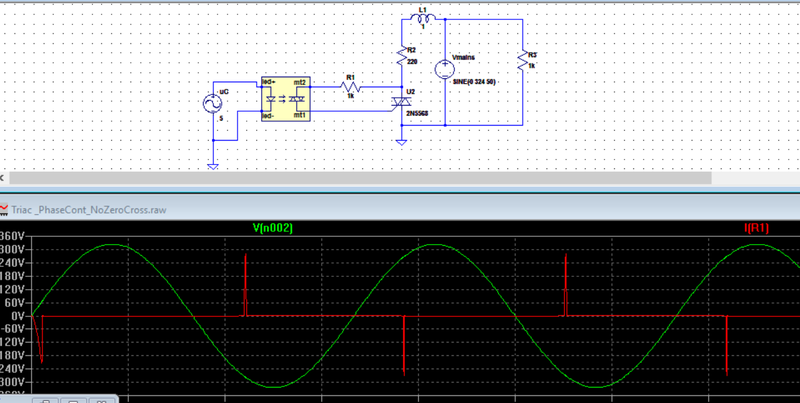 This will pass current to the triac only when the voltage across the triac is close to zero. 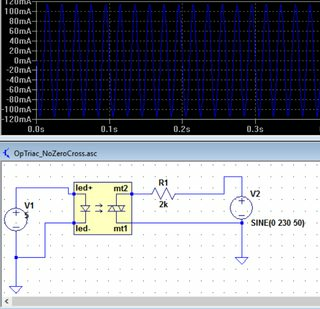 See Using AC current to trigger Triac for details on the inner working if the zero-cross circuit. Figure 3. Zero-cross circuit being switched on and off. Note the full half-cycles. In all cases the triac will remain on until the current falls to zero at the next zero cross or the power is switched off elsewhere. Note that SSRs are not "integrated circuits" in the sense of "all on one chip". If you prefer, they are packaged circuits using multiple components, usually potted into a mini-case. Okay in zero-crossing case the SCR detects and knows when to fire. But how about random firing case? Your control circuit tells it when to fire. This generally requires zero-cross monitoring so that the trigger signal timing is referenced to the zero-cross point. How is the triac inside the SSR is fired? What does firing it randomly means if the DC in constant ON all the time? If DC is on all the time the triac will be triggered after every zero-cross. How often it fires in this case and would that create some surges? No because after the first cycle it is turning on at zero volts. This is the least stressful for the triac. Or in constant DC in case the triac is always on and there is no firing? The confusion arises because a triac is not a transistor and unlike a transistor it will not be ON when its gate is always ON right? Phase Control Using Thyristors by Littlefuse. Thyristor Theory and Design Considerations Handbook by ON Semiconductor. "Random" is a misnomer as usually the trigger point is anything but random and is controlled. What is meant is "variable" trigger-point. In your Figure 2 the DC is on all the time. As the AC voltage across the U2 rises the zero-cross circuit hasn't shut off the trigger yet. The blue trace shows the current into triac U2. Once it reaches the trigger value the triac switches on, the voltage across it drops to (almost) zero so the trigger current drops to zero. The triac keeps on conducting as is its nature. In your Figure 3 the triac turns on as soon as possible after the zero cross. It's pretty much the same as Figure 2. In your Figure 4 I can't make out where V[n002] is referenced but it's obviously out of phase with the voltage across the triac as the current through R1 is proportional to that. Again, I'm not sure what you're showing in the Figure 5 trace. More questions - comments on those you asked Richard Crowley. 1-) Does that really fire 100 times a second for a 50Hz AC? 2-) About random-fire SSR case when DC in is always ON: How many times will the inner triac fire randomly? how would be the waveforms? It's not "random". It's variable phase angle. Your control circuit decides when to turn on the LED. If you want 50% power you have to detect the zero-cross and wait 5 ms every half-cycle before triggering. The waveforms will be as in my Figure 2. What I understand is that if I use "random-firing SSR", I will still have fine AC but the very first cycle could be problematic. Is that right? Since the rest will fire at zeros as you said? Correct although "problematic" might be overstating it. Zero-cross generates minimum noise, transients, electromagnetic radiation and is easiest on the triac and load. Figure 4. From OPs link in comment. In this simple circuit the LED is continuously powered. The opto-triac is in continuous conduction (once the voltage has risen high enough for it to turn on). It is behaving like a simple switch. The blue waveform is the current through the load. In more normal use the opto-triac is wired across the power triac as shown in my Figure 1. As soon as the power triac is turned on there is (almost) no voltage across it anymore so no current flows through the opto-triac series resistor after the trigger "works". Try dropping the excitation down from 230 V to 6 or 12 V and the resistor to 100 \$\Omega\$ or so. You should see that there is no current until the voltage is high enough to trigger the triac. This happens on the 230 V too but much sooner and the resolution of your chart isn't enough to see it. If you were attempting to create an additional speed control with your SSR plus the ebmpapst speed controller box, then you might have a problem. HOWEVER you are using your SSR only as an ON/OFF switch. So none of the warnings in those sources apply specifically to YOUR circuit. But congratulations for doing due diligence and investigating possible problems. Kudos. You can use EITHER type of SSR (Zero-Crossing or Random-Fire) because you are implementing only a "static" ON/OFF function. The Zero-Crossing SSRs seem much more readily available than the Random-Fire kind. The Zero-Crossing SSRs have extra circuitry which "delays" your trigger signal until the NEXT zero-crossing. Otherwise they would fire ANYWHERE, even in the middle of the wave. (Which is what "Random-Fire" means). We would want to use "Random-Fire" SSRs where we were doing something like incandescent lamp dimming etc. 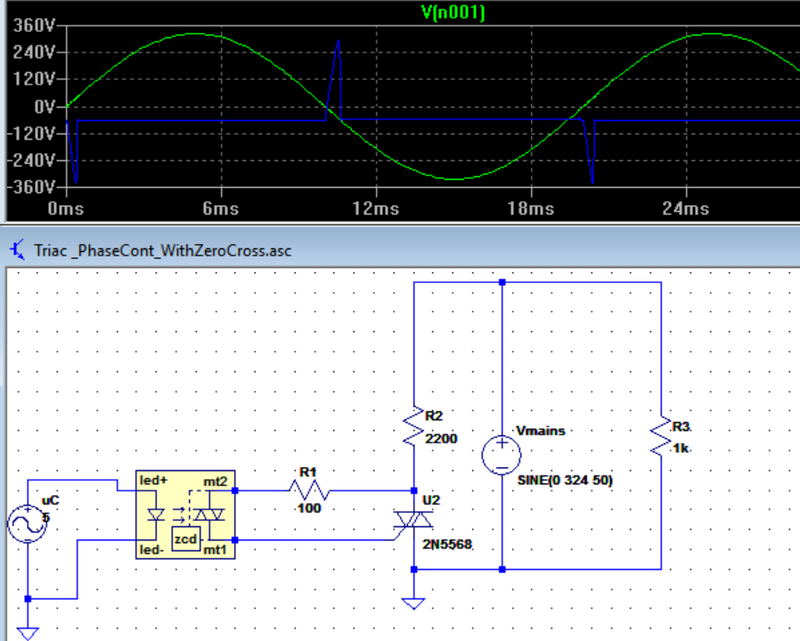 When you apply a constant gate signal to the SCR it simply "stays on" through all the zero crossings. In one sense, you could say that it "fires" again at every zero-crossing, but in fact it makes no difference one way or the other. A zero crossing relay is fine in this application. The relay remains on once it is turned on, so it is not repeatedly fired. The internal zero-crossing detector is only used to reduce surges that can occur if the switch were turned on or off when the current is high. By switching at the zero point, the instantaneous current is zero at the time the switch is closed. But the switch stays closed once it is switched. The reason you should not use it on large reactive loads is that the voltage and the current are not in phase, so the voltage zero crossing point is not the zero-current point. You might get a small "kick" when you shut off, which will be snubbed by internal snubber circuitry. The snubber has a resistive element which absorbs the energy. If you were turning on and off repeatedly, the snubber might get warm, but in your application there will be no issue. Not the answer you're looking for? Browse other questions tagged solid-state-relay zero-crossing random or ask your own question.